If your organization has blocked access to the SharePoint Store, you can manually add the app to the App Catalog so that it is available to add to your Sites. In this tutorial, you will learn how to upload and install JungleDocs for Office 365 app on your Office 365 environment. Note: to install JungleDocs for Office 365 manually on a tenant scope, you must be a Tenant Admin. 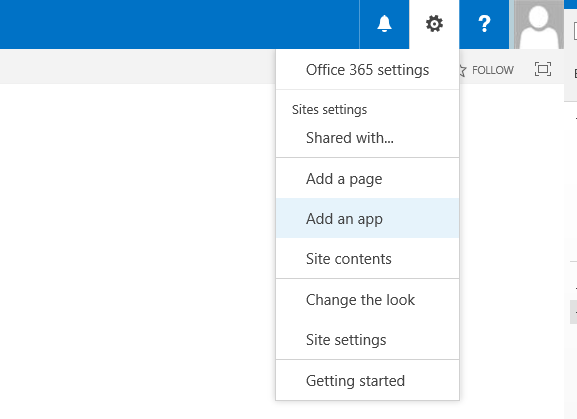 Before you begin, make sure that your Office 365 environment has an App Catalog. This is needed to make custom business apps available. Learn how to create an App Catalog on your environment here. 3. Navigate to Apps for SharePoint. 4. Click New and upload the app file you downloaded. Make sure the app is enabled. 5. 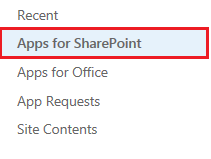 Once it is enabled you will find it under Apps you can add in your SharePoint sites. 6. Open your SharePoint Online portal and navigate to the site where you want to enable the JungleDocs 365 app. (You will have to repeat this for every Site Collection on which you want to use JungleDocs 365). 7. Click on the gear icon to open site actions menu. 8. Click Add an app. 9. Find JungleDocs 365 under Apps you can add and click on it. 10. Accept the app's permission request by clicking on the Trust It button. 11. Go grab a cup of coffee while the app is added to your site. When the app is added successfully, you will see the app icon appear in your Site Content. 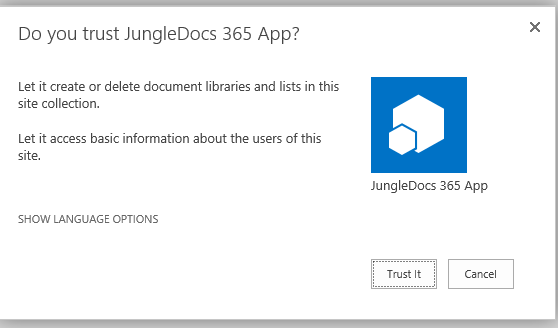 Go to the document library where you are going to create documents and start JungleDocs 365 from the ribbon. Note: depending on if you are using Classic or Modern view there are different ways in which to open the app. Find all of them here. Note: if you are using a new library experience in SharePoint Online, switch the Library experience to classic view to be able to use the Ribbon functionality. You can do it from Library settings > Advanced settings - to change the experience to a particular library; or via Admin > SharePoint > Settings > List and Library.